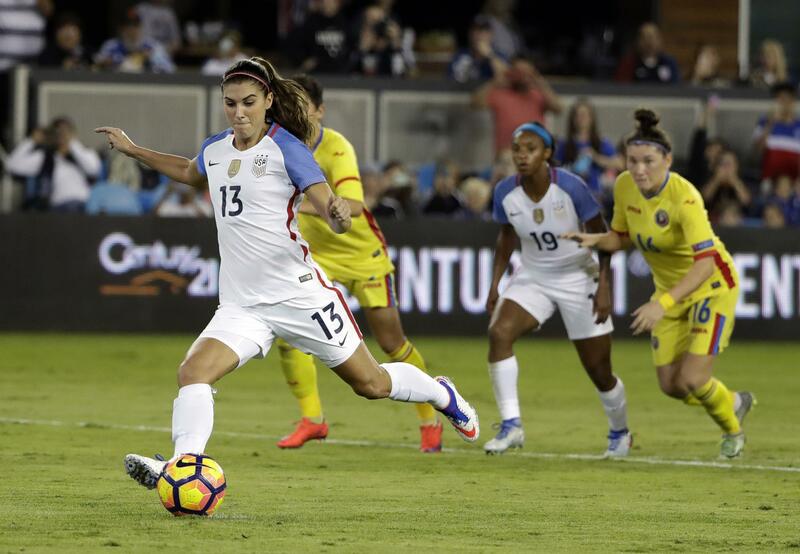 Wed., Dec. 21, 2016, 1 a.m.
LYON, France – United States forward Alex Morgan has joined European champion Lyon from Orlando Pride on a six-month deal, with an option for her to play a further season. Morgan said in a long letter on The Players Tribune website that she made the decision during “a belated honeymoon that I recently took with my husband, Servando, in Europe.” After “a few weeks of deliberation” Morgan said the decision to join Lyon became evident. Long-serving Lyon president Jean-Michel Aulas has overseen considerable success with both the men’s and women’s teams. The men won a French record seven French titles from 2002-2008 while the women have won the league 14 times and the Champions League three times. “Alex Morgan’s arrival demonstrates Lyon’s will to invest in the highest level, starting with the women,” Aulas wrote in a Tweet. The women’s squad has 26 players, all of them internationals, representing France, Germany, Norway, Sweden, Japan, New Zealand and the U.S.
Morgan says she will start playing next month and will return to play for the Pride after Lyon’s season ends in June. Morgan and other players from the U.S. national team are allocated to the National Women’s Soccer League teams by the U.S. Soccer Federation, which pays their salaries. The players’ labor contract expires Dec. 31, leaving either side in position to call for a work stoppage. “We are obviously disappointed that Alex will miss the beginning of the Pride season but understand her wishes to play in Europe and we look forward to her rejoining her teammates after Lyon’s season,” said Phil Rawlins, president of Orlando City SC, the MLS club affiliated with the Pride. But the lure of playing in the Champions League at her prime was too hard to resist. Lyon’s first league game following the winter break is away to Guingamp on Jan. 15, although she could make her debut in a French Cup game the week before at Evian. Published: Dec. 21, 2016, 1 a.m.